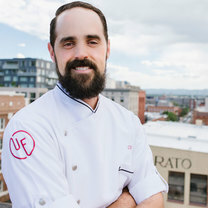 As Executive Chef of Urban Farmer in Denver, Chris Starkus curates a locally focused, sustainably sourced steakhouse menu influenced by the bounty of Colorado. Starkus highlights his seasonally-driven menu with nose-to-tail cuts of naturally-raised meat, executed with finely honed French techniques. Overseeing the whole animal butchery in-house, charcuterie program, and more, he also enjoys tending to the restaurant’s rooftop apiary and patio garden. In addition to growing mushrooms, microgreens, and sprouted grains. Inspired by America’s European ancestry, Starkus unites ingredients grown on-site with those harvested from closely regarded purveyors to offer rustic brunch, lunch, and dinner preparations with bold, straightforward flavors. "Getting ready for the freshoriginsmicrogreens"
"Spring menu launching this weekend! Seared foie gras, rhubarb compote, tarragon ebelskivers, rooftop garden marigold flowers, rooftop honey and pollen." "Spring rabbit special from Laney Family Farms, always excited for the spring bounty!"